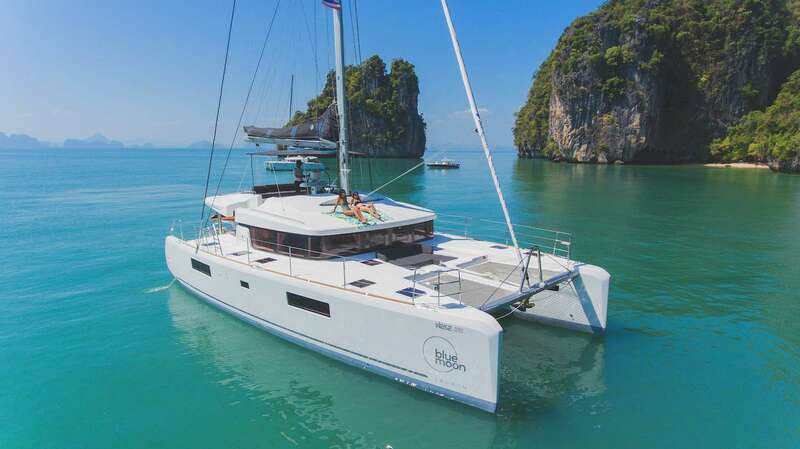 This brand new, fully loaded 2018 Lagoon 52F is now available for charter in Phuket (launched in mid. December 2017). 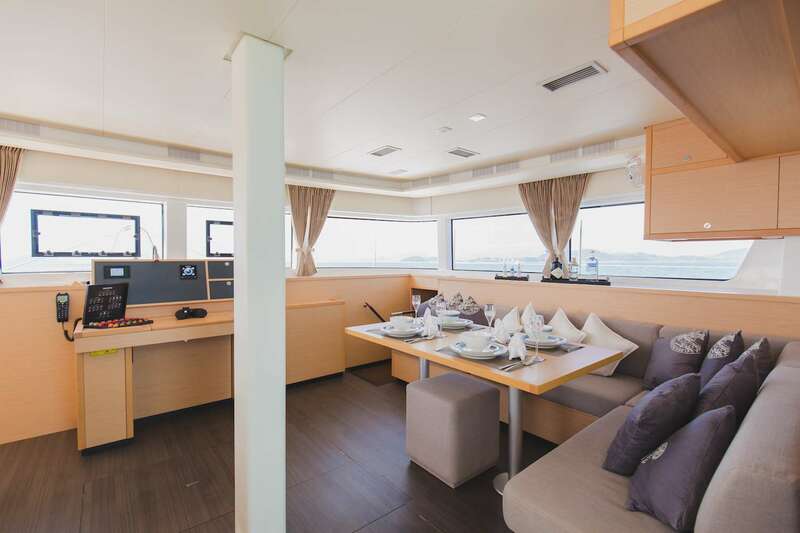 Price includes two crew (skipper and hostess) and excludes food and fuel. Be among the first to charter this incredible yacht! The Lagoon shipyard together with their yacht design partner VPLP who have used their experience of competitive sailing in developing a new style for a whole new generation of Lagoons, the Lagoon 52 is the first model introducing this new generation. 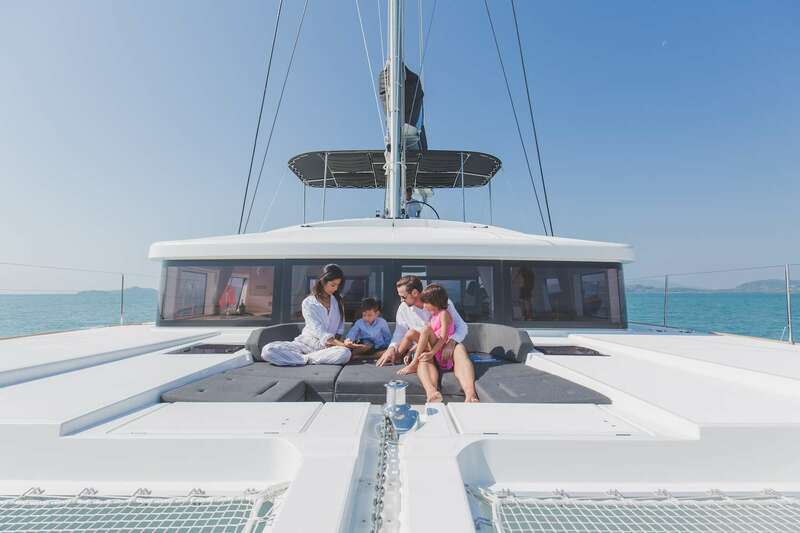 With its diamond-shaped vertical bows, contemporary styled hulls and its levitated hardtop and with a taller rig moved aft the Lagoon 52 stands out from the crowd. But its originality goes a great deal further than just its “outer” appearance, or even its interior layout. 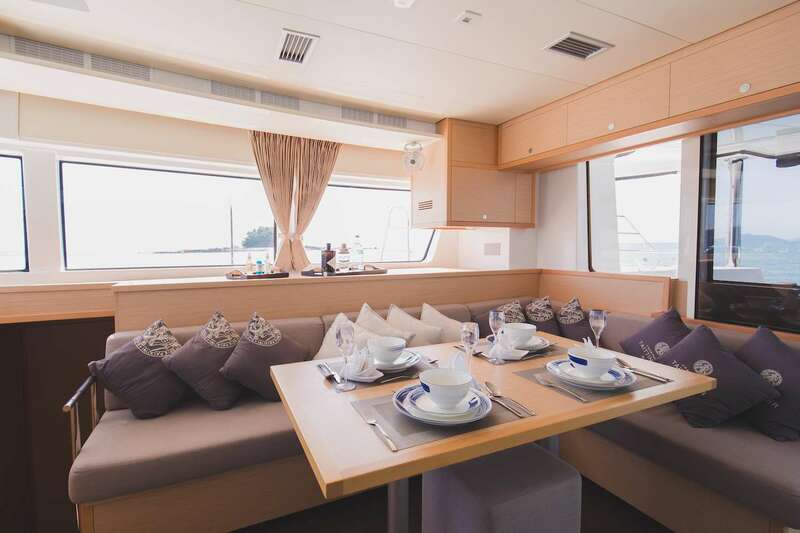 The saloon encompasses the lounge and dining table to starboard, a large galley to port which leads to direct access to the cockpit, together with the chart table in the middle, facing out to sea. 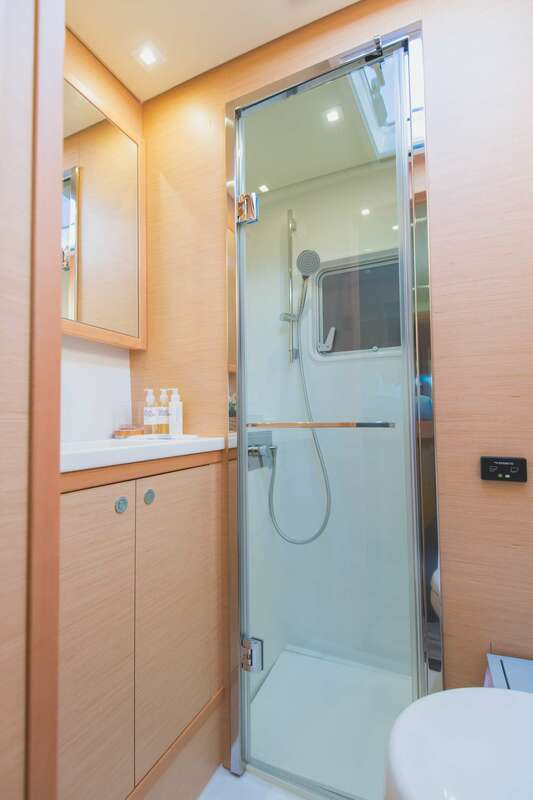 This Lagoon 52F in 2018 hull is in 5 cabin versions, including 4 queen cabins all with en-suite bathrooms and separate showers, and a bunk bed cabin with en-suite head. 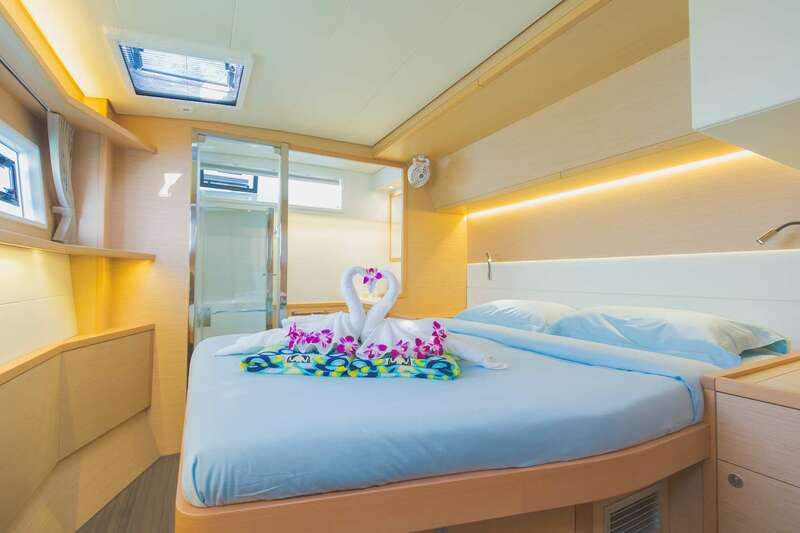 The cabins have incomparable natural lighting thanks to the fixed hull windows, together with excellent ventilation thanks to the deck hatches and portholes that open out to the hull-side or to the cockpit. 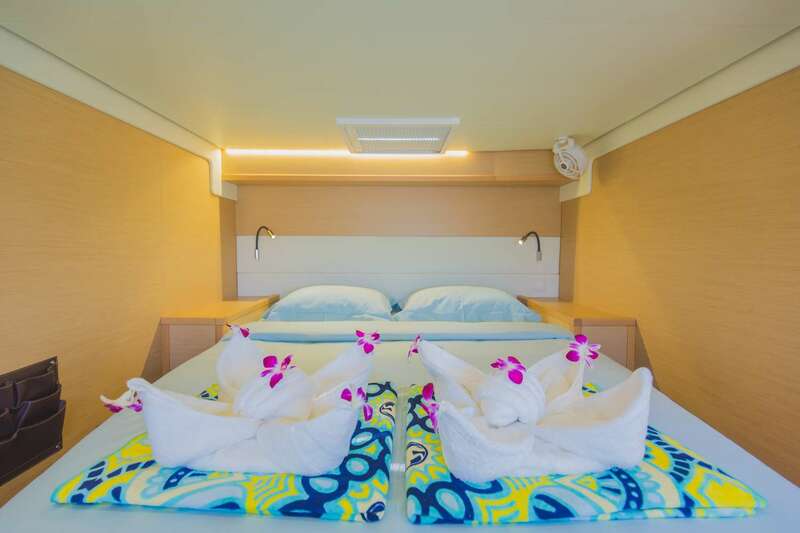 The mast is located further to aft, which brings many advantages on a cruising catamaran: a large forward triangle allows a larger sails choice: a promise for great performance. The shorter boom makes the mainsail much easier to maneuver. The mainsail, which is relatively narrower and higher, benefits from better winds at the top, thus enhancing performance by re-centering the weight in this way, pitching is considerably reduced. The yacht is accessed via open aft transoms, facilitating boarding and disembarking. She has broad side decks, with recessed deck hatches. 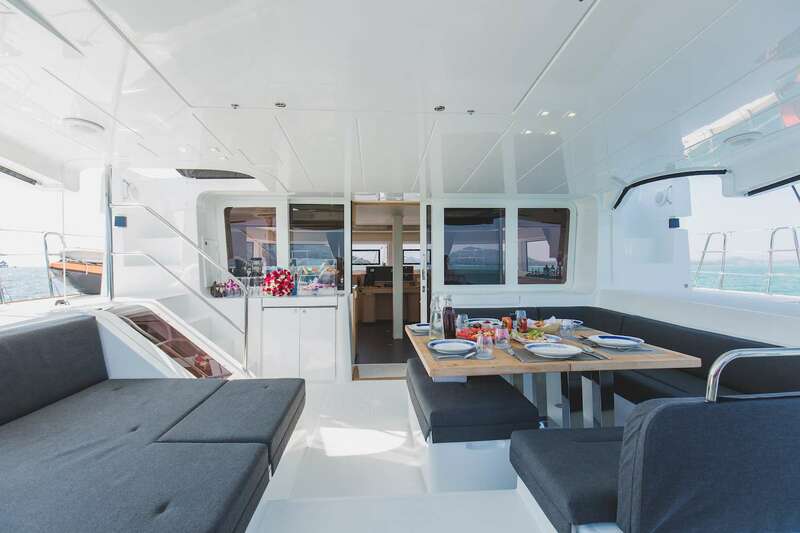 The cockpit is level with the saloon, and has an outdoor lounge and sun-lounging area to starboard. The fly bridge is reached either by a staircase leading from the cockpit, or by another leading from the deck on the starboard side. The steering station is positioned in the centre of the flybridge, giving the skipper perfect visibility. All ropes and controls are located on the flybridge, away from the living areas. A tilting steering wheel is also found which can be adjusted to three different positions, giving the skipper perfect visibility under sail or when maneuvering. 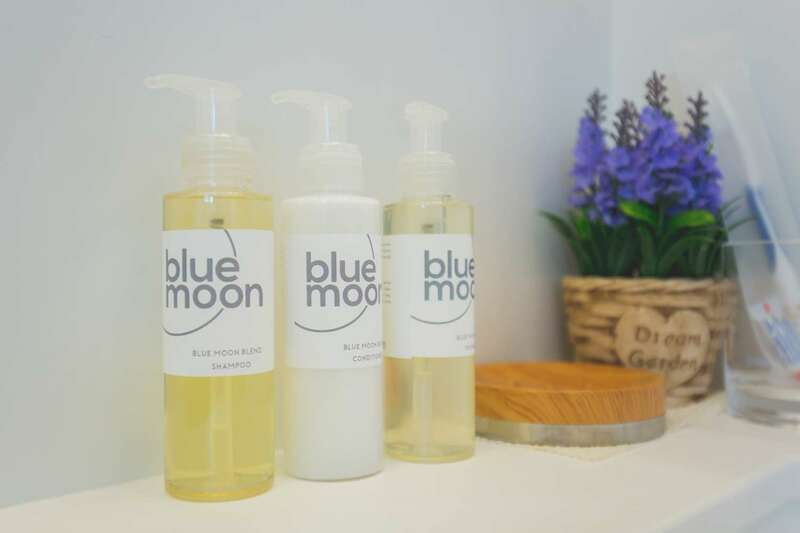 SY Blue Moon has been successfully launched and start providing high quality level charter services to her customers.